As Rents Continue to Rise, is it Time to Buy? Renters all over San Diego are continuously getting squeezed as rent prices continue to rise, amid a very low supply. According to UT San Diego, as of April of this year, rent in San Diego County was $1,630 a month, which is up 5.3 percent over the last year. What does this mean for Renters? Is it is time to buy? 1. Look into the future. Where do you see yourself in 3-5 years? Do you plan on making a job change or major live change? 2. Can you afford to purchase and maintain a property? 4. What does the local market look like? 5. Is your lifestyle conducive to home ownership? After spending some time planning, let us not forget the financial impact of buying versus renting. Realtor.com offers a calculator to help calculate the costs of buying a home versus renting a home over time. 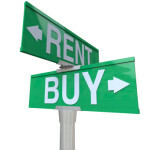 Click here to check out the rent versus buy calculator to be able to make the most informed decision. Have more questions, or in need of a real estate resource? Please give us a call or stop by our office in the heart of Downtown San Diego. Whether you are a first time home buyer, downsizing, upgrading or curious about the San Diego Real Estate market, we are here to help. To speak to someone on our Team, please call 619-GREATER (473-2837) or email us at Info@GreaterGoodRealty.com.